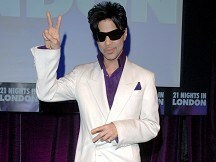 Prince is on a mission to Ireland to prove a point to his fans, the pop megastar has told band-mates. Organisers behind this weekend's 30,000-capacity gig at Malahide Castle, in north Dublin, said the performer was intent on making up for cancelling his Croke Park date three years ago at short notice. Robbie Butler, of promoter POD concerts, said he was talking to Prince's band and the only problem they expect this time round was getting the genre-defying genius to wrap up the show. "They said he wants to come to Dublin to prove a point," he said. "He just wants to come and do a great show." Mr Butler said Prince phoned the concert promoters up directly and said he wanted to come to Ireland. He added: "The only problem will be getting him off the stage." The 52-year-old singer has been playing to rave reviews during his latest European tour which kicked off in Paris three weeks ago. He has warned audiences to bring foot spray because "it's going to be funky". The Malahide Castle show on Saturday will be his first in Ireland for nearly a decade and the biggest ever event in the sprawling seaside estate. The set list is expected to include many of his greatest hits, including Kiss, Purple Rain and Raspberry Beret. He is planning at least a three-hour set, said organisers. Workers are putting final touches to the huge stage next to Malahide Castle, which will include two massive LED screens on either side, as well as another behind the stage as a backdrop. Behind the scenes Prince's yurt-shaped dressing room has already been erected, which includes a purple dressing robe, purple towels, sofas, a mirror, bottles of champagne, Limoncello, Merlot and Fiji water. Amy Winehouse could have as many as seven songs in the top 40 this weekend, according to figures from the Official Charts Company. The Kooks' frontman Luke Pritchard has revealed he regrets letting his partying take priority over his music. Keri Hilson has apologised for joking about Amy Winehouse just hours before the tragic star's funeral. Amy Winehouse was the happiest she had been in a long time in the run up to her death, the singer's father has said. Singer Amy Winehouse was the happiest she had been in a long time in the run up to her death, her father has said. The grief-stricken father of Amy Winehouse paid tribute to the "greatest daughter" as her family and friends said their last goodbyes to the 27-year-old singer.